We all live for our summer holiday, that’s for sure. The feeling of sun rays on our skin, the hot beaches along with hot girls in bikinis and the taste of cold ice cream on a hot sunny day. Well, that sounds like paradise, right? And now you can have a taste of this paradise with Playtech’s Beach Life slot. 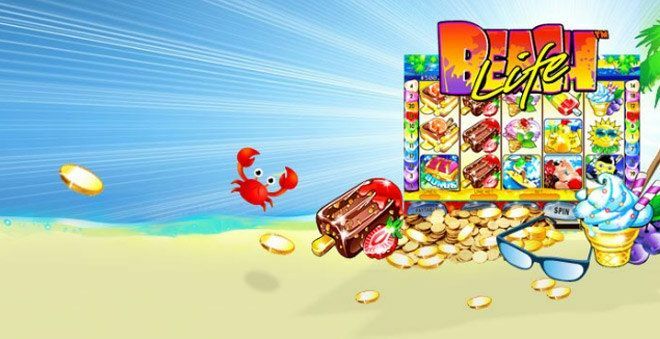 Relax with this summer edition slot and try to win your own holiday with Beach Life’s progressive jackpot hiding in the yellow sand of the exotic beach. Centered on summer holidays, this slot is a true representation of a perfect day on the beach. The colorful and bright design says it all: the summer has come to your screens. The bright reel board lies on the golden beach sand with the blue wavy sea in the background. And the symbols are the ones that give out the taste of summer and leisure. Beach Life slot takes you on your well-deserved holiday. So, try out its cake and different kinds of ice creams and form some winning combos. For even better wins ride those wives with its surfer, sunbathe with a pretty girl or join the scuba diver in the search for bigger payouts. Apart from these symbols, Beach Life offers you three more symbols: wild, scatter and bonus symbols, with the wild being the one that has the prospect to win you your own holiday. While you are relaxing on the beach, there are some sunken treasure chests at the bottom of the blue sea. And here you’ll have the chance to reveal some treasure chests with the ‘pick me’ bonus round. It is activated by landing 3 or more chests bonus symbols on the reels. New screen with numerous chests will show and all you have to do is pick them and reveal the cash prize. More bonus symbols landed on the reels means more picks for you in the bonus round. As for the scatter symbol, if there are two or more anywhere on the reels you get an additional win. But you may be a bit disappointed as we are because the scatter is not the key for unlocking the free spins rounds as usual, because there are no free spins included in this slot, which is a downside. Be that as it may, this is a minor flaw since Playtech people have included a progressive jackpot. So, we can forgive them the lack of free spins rounds even if we have less winning opportunities. The role of the wild symbol is the reason we can turn a blind eye to the lack of free spins. And this is why: except substituting for all other symbols and being the highest paying symbol, the wild here can also bring you a progressive jackpot, that’s right. And the way to achieve this is as simple as it can be. You just have to land 5 wild symbols (the sun wearing sunglasses) on the 20th payline. Ok, it may not be as easy as it sounds but if you eventually manage to do this, you will be able to afford all the holidays you want. Unfortunately, there is no bet adjustment on this 5-reel 20-payline slot. All players must stake £0.50 per line. But the players can choose to play between 1 and 20 paylines, which means that the total maximum bet is £10. And you can just click the Max Bet option and play with the maximum stake. And it is important to know that if you play this slot in order to challenge your luck and win the jackpot you must play with all 20 paylines, as that’s the rule. All in all, if you like simple but bright and colorful designs you will enjoy this slot. Apart from its sunny theme, this slot is a more than a solid one since it offers a frequent ‘pick me’ bonus, big payouts and most importantly a handsome progressive jackpot. So, if you like the possibility of hitting the right sunny combination and winning the jackpot, then you should definitely check out this slot.